So as you may have read in the previous post, Cassi & I are 1 of 3 finalist in Clay Hill Farms Green Wedding Giveaway. As part the contest we are to create a community giveback project. 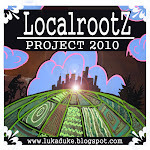 It only seems fitting for us to reignite our local food mission that engulfed most of 2009 and the whole 2010 year. To create more awareness about the wonderful foods that are available even in the tough month of March, we have decided to eat a 100% local diet from March 7th till the voting ends on April 8th. 1. Economy. Every dollar we spend goes directly back into our community and into the pockets of people who share our same values. Statistics show that when a dollar is spent on commercially grown food, only a fraction reflects the farmers share, the rest goes into marketing, transportation and the distributors. 2. Conservation. Supporting local farms conserves land in our community from being developed creating open space that promotes wildlife and natural ecosystems. 3. Carbon Footprint. The average meal in America travels over 1500 miles from field to table...as well as the long distances most of these journeys require refrigeration adding even more of a carbon footprint. The average distance of a local meal is within 100 miles. With rising energy costs the prices of foreign unseasonal items is climbing higher and higher. 4. Farming Practices. The practices of local farms, for things such as pesticide use, treatment of animals and overall sustainable practices of the farm are much more transparent and usually just a conversation away. Alot of times an invitation to come out to tour the premises are not uncommon. With most commercial food there are broad guidelines creating two categories Organic/Conventional...neither aspect is very transparent and place of origin and farming methods used are often not available to the public. 5. Variety. Many local farms believe in diversity which helps limit the chances of total crop failure. They also love a challenge, so they are always trying new things or reviving an heirloom or heritage breed. Many commercial operations are built to produce marketable products that travel well and retain a standard shape, size and color. 6. Taste. Most important of all. Local food is picked and delivered at its perfect time, creating a product that is made for the plate rather then a product that was picked before its peak to compensate for the days spent being shipped and sitting on supermarket shelves. With these reasons in mind... we will post some pictures of the meals we prepare as well as some of the sources of local food that we have available in the greater Portland area. Here is what was on the menu so far... more pictures in the future, just found the battery charger ! the pollock was battered in egg and locally grown and ground cornmeal then fried in a pan with Swallowtail butter...the beets were roasted in the over then left to cool before being tossed with Olivia's greens,Leanne's honey from Scarborough and Ricker Hill Orchard Cider vinegar... Yum ! I've voted for you guys! I love how you support local food -- I ate exclusively locally a few summers ago from June - October, and I learned so much about food, Maine, and seasonal eating. It was such a great experience that I try to buy locally when I can - especially in the spring/summer/autumn. I'm loving freedom farm's golden beets right now, too! Thanks for the kind words and support ! Can't wait for all the new greens to start popping up at the market... in fact i think we are gonna start some seed germination this weekend !